On March 1, 1925, the New River Pocahontas Coal Company acquired the Fayette County town of Kaymoor and its mining operations. The new owner, a huge international company, began shipping coal from Kaymoor to the Atlantic Coast in Virginia, where the coal was used to fuel naval and merchant marine vessels. Kaymoor had been established in 1899 by the Low Moor Iron Company and named for its first superintendent, James Kay, a pioneering coal operator in southern West Virginia. Kaymoor was actually two villages—one located at the top of the New River Gorge and the other at river level—creating two culturally different communities. The two were linked by a steep inclined tramway known as the “haulage.” Everyone in Kaymoor—from the miners to children attending school—road in the precarious haulage. 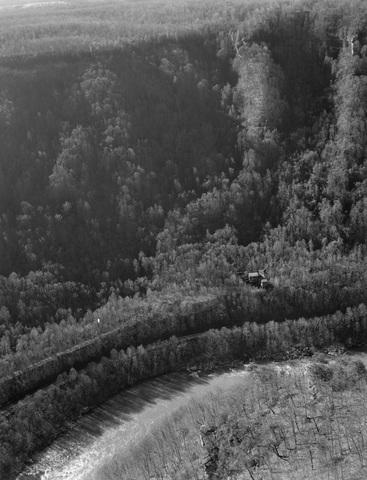 Kaymoor’s coal seam was worked out by the early 1960s, and the mines closed in 1962. The area remained relatively untouched until the National Park Service took ownership of the site. The few remaining structures and ruins at Kaymoor are striking reminders of the New River Gorge’s once-booming industrial era.